Mixer Tap Repairs. This easy DIY guide explains how to go about repairing a mixer tap. We show you how to repair a dripping mixer tap or a leaking mixer tap in your kitchen or bathroom. There are different ways to dismantle a mixer tap, and we show you fix some of the most common styles. Mixer taps comprise of three seperate areas when it comes to repair. The individual water controls (hot and cold) on either side are repaired and serviced as individual taps and repair information for leaks and failure here can be found in our repairing a dripping tap project. When it comes to repairing a mixer tap, the spout is the weak link and can sometimes leak at the base. This can be repaired quite easily and details are covered below. Mixer spouts are held on in three ways, either there is a large snap ring between the spout and the body (this is normally hidden by a "skirt" which either screws down or is held in position with a very small "grub" screw, normally at the back) which can be closed and removed with a pair of pliers. In some cases there is a small grub screw at the back, which when undone will allow the spout to be pulled upward from the body and finally, some mixer spouts have no actual fixing holding them in. This type allows you to simply pull up on the spout and release it from the grip of the seal which is generally on the bottom of the spout. The first two mentioned above have normally got a seal ring within the base. This seal ring, over time, will wear and cause leaks, usually from the base of the spout. As you may imagine from the above, to resolve any leaks of this kind you will need to replace the seal ring. Once you have removed the spout, look down inside the neck and locate the seal ring. In some cases you will be able to hook the seal out with your finger but if you are unable to use a small flat edge screwdriver to hook the seal out. Depending on the make and model of your mixer tap will in some cases depend on the size of replacement seal ring you will need to use. The quickest and easiest way to get an exact match replacement is to keep the old one and take a trip down to your local plumbers merchants and ask them for an exact replacement or a plumbers repair kit (seen below). You may be lucky enough to have a selection of washers, O-rings, seals etc… in the form of a plumbers repair kit. If so have a look through and see if you can find a replacement. If not, then you will have to resort to a trip to your local plumbers merchants. Once you have your replacement you will need to re-fit it. Drop it back down inside the neck of the tap and make sure it sits neatly at the base. Once the seal ring is in place re-fit the spout and secure it and you’re done. 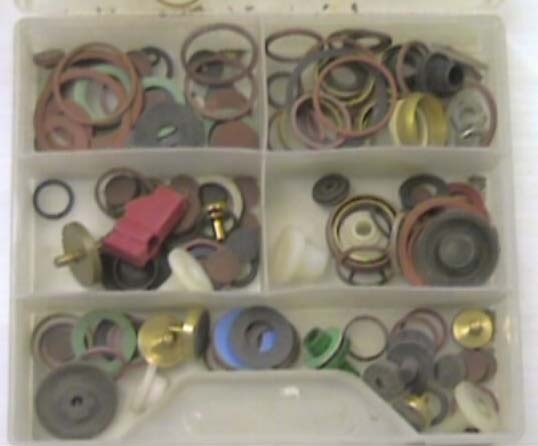 A box of washers in the form of a plumbers repair kit can be bought from most plumbers merchants or your local DIY store. In terms of repairing a mixer tap that’s pretty much it. As commented above, if it is your taps that are leaking visit our how to repair a dripping tap project for more information. We have made every effort, under copyright law, to find the owner of some of the pictures above. If you have information which may help, please contact Diy Doctor. Thanks to Anthony Rudge for the following information……. I have found a fourth type of mixer tap which requires a different method of repair. The spout is secured to the body of the mixer by a ‘key’ which runs in a groove in the body allowing the spout to rotate from side to side. 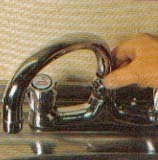 To disengage the key and thus remove the spout, it is necessary to push the spout to the left (as you are facing the sink) and line it up with the body of the mixer. Lift, wiggle, and it comes away quite easily. There is a keyway in the body at the centre back which must be lined up with the key in the spout before removal can be effected. Another reader, Lance, had a leak under the tap. He replaced everything, eventually including the tap but any water splashed on to where the tap was seated resulted in drips underneath. Eventually he found that water was passing the ‘O’ ring supplied for the base of the tap. He solved the problem by removing and then re-fixing the tap, ensuring that the tap and ‘O’ ring were aligned properly around the hole in the sink. One to watch out for – thanks, Lance! Check out our video on section on bathroom leaks and also how to repair a tap to watch a couple of films on repairing plumbing in your home.